It seems these daily deal sites have really taken a liking to href=”http://code.google.com/android/” rel=”homepage” target=”_blank” title=”Android”>Android over the past year or so. Another Android device is being offered for cheap and we think most of you looking for an unlocked GSM version will appreciate this one. 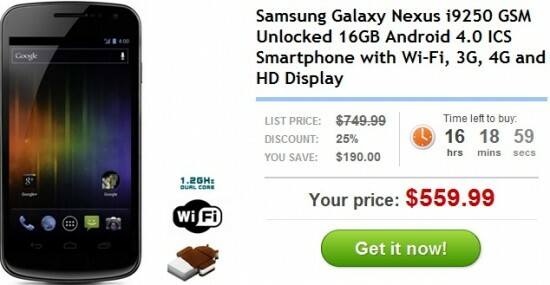 DailySteals is offering the unlocked GSM Galaxy Nexus 16GB for $560. As most other players have this thing for $600-$700 (most closer to $700 than $600), $560 is a lot closer to the norm for an off-contract device in this range.